Is your dog, cat or “pocket pet” so much a part of the family that you just can’t bear to leave them at home during your family Disney vacation? Well, then you’re in luck, as Best Friends Pet Care Resort, a luxury pet resort at Walt Disney World Resort is now accepting reservations. Reservations are being accepted for pet boarding stays beginning Aug. 27, 2010, for the new facility. This is the first time overnight boarding has been available at the Walt Disney World resort. Update: I forgot that Fort Wilderness and TTC currently has overnight boarding. While the new facility may be a step up in service, with overnight boarding now available, it is a huge drop in convenience. Update: According to the Best Friends Pet Care website, the new facility will consolidate all the current WDW kennel facilities into one location. This is quite a bit less convenient for guests who are used to being able to drop their pets off right outside the main gate of the park they’re visiting that day. Feline guests will spend their visit in the separate “Kitty City” pavilion – away from the dogs – in two- and four-room condos. All suites and condos are designed to provide comfort and privacy and will be cleaned daily with hospital-grade disinfectants. The resort’s exclusive dog park features a fenced walking trail bordering the natural wetlands around the park. Inside the trail, guests can choose from a variety of different play areas, including a 3,300-square-foot area covered in artificial turf, a 4,500-square-foot area with shade trees and a 1,300-square-foot “canines only” water park. There are several large areas for owners to sit, relax and watch their dogs play. The entire park is secured from outsiders and is illuminated for use after dark. Other features of the resort include: a grooming salon, which will provide go-home-fresh baths and haircuts for pets; two 1,100-square-foot “camp rooms” for play group and doggy day camp, each opening onto an outdoor play-yard; and a special facility for the boarding of “pocket pets,” such as hamsters, guinea pigs, rabbits and ferrets. Pet parents can choose from a wide range of a la carte activities for pet guests from one-on-one playtimes and social playgroup with other doggy guests, to cuddle time and bedtime stories with staff. Additional amenities and upgrades include Ice Cream Treats, Bottled Water and Premium/Orthopedic Bedding. Feline guests can also enjoy private playtimes, activity toys in their suites and treats such as Cookies and Milk or Tuna on a Ritz. The pet resort is located across from Disney’s Port Orleans Resort at 2510 Bonnet Creek Parkway in Lake Buena Vista, FL 32830. 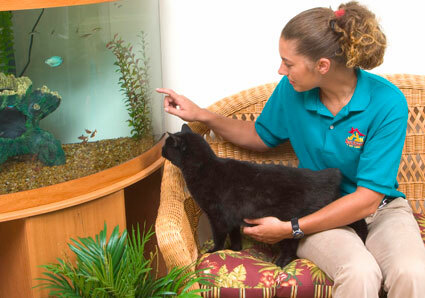 Pricing and other details are available at wdw.bestfriendspetcare.com or by calling 877/4-WDW-PETS.